Faced with brick or stone, these are the most common fireplaces found in Texas backyards. With a square or arched mantel and a mantel above the hearth, they complement a ranch, colonial or cottage style home. Most usually, a traditional outdoor fireplace can be used to anchor an outdoor sitting room or entertainment space. For a more colorful approach, consider adding an outdoor fireplace in this style from the Old World. Brightly colored ceramic tiles – in a single or varied – colors is added around the firebox. The result is a stylish fireplace that is as easy on the eyes as it is on the skin. As an added bonus, these tiles are quite easy to clean – a not inconsiderable benefit for something located outside. These style is rather striking to those who have not seen it before. It features a stucco finish over the fire bricks creating a very distinctive if somewhat rustic look. For an even more authentic feel, consider installing a kiva. Reminiscent of a Mexican bread oven, this type of fireplace has a dome-like appearance and is ideal for situating in a corner as a focal point in your outdoor space. If your design aesthetic runs to a more minimalist and modern one, there are plenty of outdoor fireplaces that will satisfy your taste. Modern outdoor fireplaces run the gamut from simple gray concrete finished ones through metal sheathed ones. In every case, their relatively undecorated style allows them to be used with almost any type of décor. Nothing stands out in an outdoor space like a roaring fire and a firepit redoubles the enjoyment. You, your family and guests can sit in a circle around one of these wonderful fireplaces and converse more easily than with a standard fireplace. They are also a great place for the kids to toast marshmallows or make s’mores. As you can see, there any number of options when it comes to choosing an outdoor fireplace. Increte of Houston has a knowledgeable in-house staff to help you make the right choice and the experience to make sure the installation is properly done. 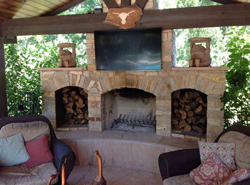 For further information on outdoor fireplaces in the greater Houston area, please contact us here or reach us directly at 281.499.3990.